NAHA, OKINAWA, Japan — Third Transportation Support Battalion, 3rd Force Service Support Group and Battalion Aid Station, Combat Assault Battalion, 3rd Marine Division were recognized by the Japan Good Conduct Association’s Okinawa chapter for their contributions to the local community in a ceremony here June 11. Marines and sailors from both units were recognized along with several local organizations. Local community leaders and Brig. Gen. Frank A. Panter Jr., 3rd FSSG commanding general, joined them in the ceremony. According to Col. Doarin R. Lewis, 3rd TSB’s commanding officer, more than 200 service members volunteered their time and services throughout the year. The battalion participated in several community service projects, which included visits to local orphanages, senior citizen homes and elementary schools. Service members from 3rd TSB did performed many chores at the senior citizen homes and orphanages. The service members also played baseball with the orphans. Both units being recognized taught English to local elementary school children. Third TSB organized visits to many local elementary schools near their camps. 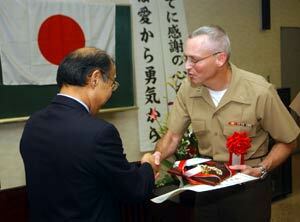 The Aid Station Corpsmen regularly teach English to children and adults in Nago and Henoko. In addition to helping the local community members, 3rd TSB organized local beach cleanups. 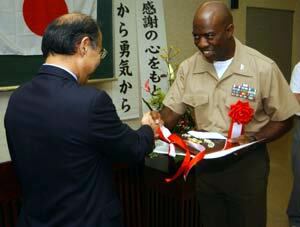 “This kind of service helps the Marines realize they are part of a larger community,” Lewis said. Lewis and Navy Lt. G. Alan Fleming, the battalion chaplain, were in attendance to accept the award on behalf of 3rd TSB. Navy Lt. David You, CAB’s battalion surgeon, accepted the award for his unit along with seven sailors from the aid station. “We enjoy being part of the community and giving back,” said Chief Petty Officer Josephus Carter, a hospital corpsman with CAB. Fleming addressed the association after the presentation of the awards. He emphasized that it was an honor to serve the community. “It’s a token of our appreciation for our host country’s generosity and our desire to contribute to the communities where we live and work,” Fleming said. 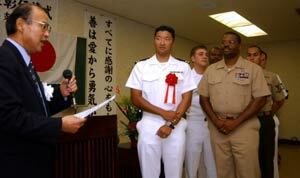 The Nippon Zenkokai, which is the Japanese name for the Japan Good Conduct Association, was founded in 1980 and first included service members in 2003. According to Lewis community service not only benefits the local area, but also the service members who participate. “It helps troops adjust to life in a different country by becoming comfortable with the culture,” Lewis said.